'Dirigo By Design' ( John White, R. 2000). Seedling. 965B-MW5-4. SIB (tet. ), 26" (66 cm), Midseason late bloom. Standards medium blue violet, whitish edge; style arms white, slight aqua rib, feathered; Falls medium blue violet, whitish edge, yellow signal; ruffled. 'Dirigo Ruffled Feathers' X feathered sibling 93K-B11-5. Eartheart 2006. Interested in Siberian iris? 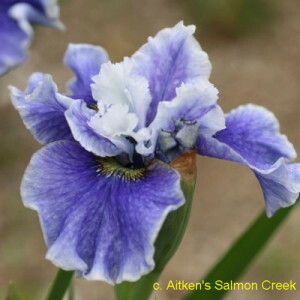 Please visit the: The Society for Siberian Irises website.